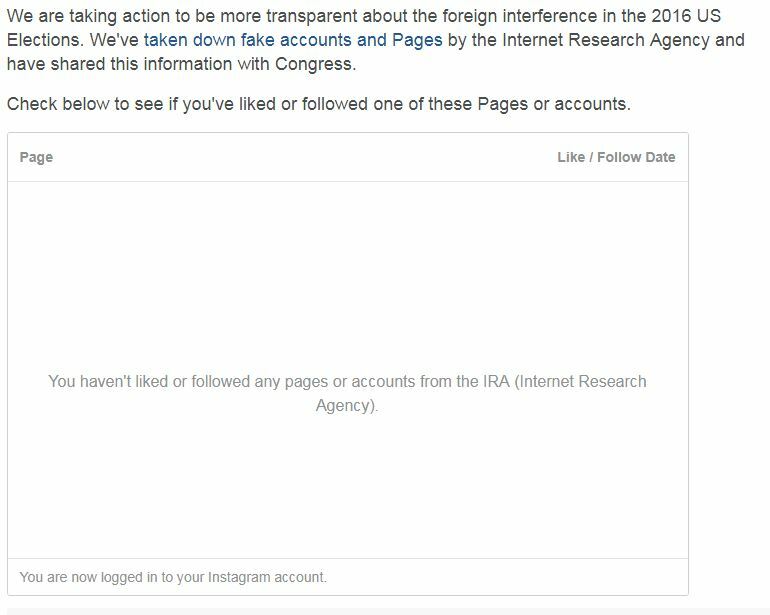 Facebook recently posted a tool which will check whether you followed any of the alleged Russian Facebook pages or Instagram accounts. I thought it was certainly a possibility as during the election I did follow several anti-Clinton pages. It looks like the were all legitimate after using their tool. Several Facebook friends have also checked and so far I have not found anyone who reports that any of the pages they followed was Russian. Russian material very likely was lost among the huge amount of noise present on Facebook. Russian material was a minuscule percentage of overall material on Facebook. The Congressional testimony revealed that material from these Russian pages accounted for “less than 0.004 percent of all content — or about 1 in 23,000 news feed items” on Facebook. That is hardly enough to have impacted the election result. It is also probably because the Russians ads appear to have been targeted towards a more conservative audience. Most people are not likely to change their minds as to who to vote for based upon something they see on Facebook, and people joining a political group already have their minds made up. Sure they can get some clicks by posting anti-Clinton material directed towards Republican voters, but those voters 1) already have seen the same from multiple other sources, and 2) were not going to vote for Clinton even before seeing material from Russia. While the Russian material is portrayed as being pro-Trump and anti-Clinton, much of it had nothing to do with the election, and that which was about the election was not necessarily pro-Trump. The biggest success attributed to Russia on Facebook has been to get 5000 to 10,000 people to turn out for a rally–a rally protesting against Donald Trump after the election.